Home > Car Wax, Sealants, & Coatings > Car Waxes and Paint Sealants (Synthetic) > RejeX Paint Sealant 16 oz. 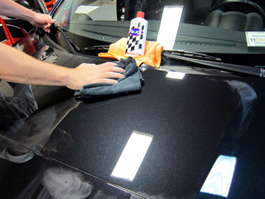 RejeX is an ultra thin polymer coating that keeps auto paint clean for four to six months! RejeX is a paint sealant and anti-stick coating in one. RejeX prevents stains and adhesion of exhaust, insects, oil, tree sap, bird droppings, brake dust, and road grime. Plus, RejeX creates a deep shine that rivals any wax! RejeX is an incredible feat of paint care. It provides a durable, high-release finish that is impervious to common vehicle contaminants, meaning they can't get through! Corrosive bird droppings and bugs stay on top of the RejeX film, where they cannot etch the paint. Tree sap and road grime are rejected. They just can't stick to the slick finish. RejeX also retards the oxidation process by sealing the paint behind a polymer coating. Imagine your vehicle coming clean with just a quick rinse-off with the water hose. 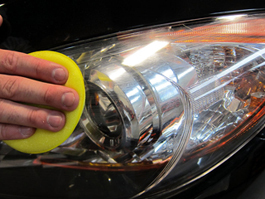 RejeX's anti-stick coating prevents contamination from adhering to the paint. A jet of water is all it takes to remove most common contaminants, saving you the time and effort of scrubbing your vehicle. 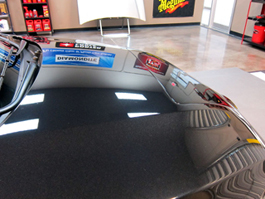 RejeX works on nearly every automotive surface! Use RejeX to seal and protect painted metal, acrylic, gel coat, fiberglass, glossy plastic and polished metal surfaces. Use it on the wheels, bodywork, headlights, and grill. Use RejeX on your boat, RV, ATV, airplane, and motorcycle. RejeX will keep your entire collection of vehicles well-protected with minimal upkeep. Remember, a blast of water is all it takes to release most contaminants from the slick finish. RejeX is the only paint protectant you need! It lasts longer and protects better than most paint sealants. RejeX has a higher refractive index than most waxes, so it produces a deeper, richer luster. Apply a coat of RejeX and there's no need for any other wax. In fact, wax can't adhere well to RejeX's high-release finish. That's a testament to RejeX's ability to shield your vehicle from anything it encounters. Wipe RejeX onto the paint in a thin, even coat. Buff off RejeX with a soft, clean microfiber towel. Application is easy. Shake RejeX well and apply to a clean, dry surface that is cool to the touch. Do not apply in direct sunlight or in temperatures greater than 85° F. After RejeX dries to a haze (about 20 minutes), simply wipe it off with a soft microfiber towel. 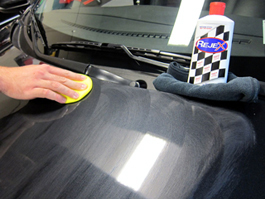 Unlike waxes that require strenuous rubbing or buffing to remove, RejeX easily wipes on and off. Allow RejeX to cure for 12 hours out of the elements. RejeX Paint Sealant leaves a deep, reflective shine on all paints. Use RejeX to protect plastics, too! RejeX works by cross-linking across the paint to form a clear, impervious coating. To do this, RejeX must cure for 12 hours after application. This curing time is essential to the performance and longevity of RejeX. During the curing time, the vehicle should not come into contact with water, oil, cleaners, soot, or any other contaminants. Once cured, RejeX will provide up to 12 months of protection on paint that is in good condition. Most vehicles will require reapplication every 4-6 months for optimum protection. Additional coats of RejeX can be applied as long as you wait 8 hours between each coat. If at any time you wish to remove RejeX, simply use a polish, paint cleaner or compound. RejeX does not contain the silicone oils found in some other products that contaminate paint. RejeX contains no abrasives. Use it on glass, windshields, and clear plastics, including Eisenglass and Plexiglas. It repels water to maintain better visibility and a cleaner surface. Applied to wheels, Rejex prevents brake dust adhesion to make future cleaning easier. Because RejeX is a true paint sealant, it is important to properly prep the paint before applying RejeX. Polish and/or clay the vehicle to remove any imperfections or embedded dirt before applying RejeX. The finish will look cleaner, clearer, and more brilliant. Give all your vehicles the ultimate protection against dirt and grime plus a deep shine with RejeX! The high-release polymer finish rejects contamination to keep your vehicle clean and protected. RejeX Paint Sealant 12 oz. How To Wax Your CarCar Waxes (Carnauba)Car Care KitsPinnacle Black Label SynergyPinnacle Crystal SiO2 SprayWolfgang Füzion Carnauba Polymer Estate WaxWolfgang Füzion Carnauba Polymer Estate Wax 3 oz. Mini Wolfgang Deep Gloss Paint SealantWolfgang Deep Gloss Combo 3.0Wolfgang Deep Gloss Liquid Seal 8 oz.Wolfgang Deep Gloss Spritz SealantWolfgang Uber SiO2 Silica SprayKlasse ALL-IN-ONE PolishKlasse High Gloss Sealant Glaze 16.9 oz. Pinnacle Black Label Diamond Paint SealantBLACKFIRE Paint Sealant 32 oz.BLACKFIRE Synthetic Spray Wax 32 oz.BLACKFIRE Wet Ice Over Fire KitBLACKFIRE SiO2 Spray Sealant 32 oz.BLACKFIRE HydroSeal Coming Soon!BLACKFIRE HydroSeal Concentrate Coming Soon! Far exceeds the shine of any wax. Product was shipped in a timely manner and easy to use. What a great product! Good sealant and protectant for your car's paint. Tried others but Rejex is the best out there. Will never change from Rejex.